Windy winter days have their advantages for photography. 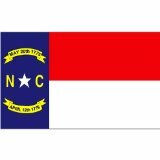 Without leaves on the trees, the unfurled US and NC flags can be seen clearly. The flags, with matching colors, yet different patterns, complement each other. These flags are flying proudly on Spring Garden Street on the campus of the University of North Carolina at Greensboro.